The programs and presentations offered by the mental health professionals at the LRJ Foundation are offered at no cost to the school districts and community organizations who benefit f rom them. Becoming a donor or corporate sponsor means that you can directly impact our mission to bring mental health education to at-risk youth and the teachers, coaches, friends and parents who can learn to identify the warning signs and intervene in order to save a child’s life. 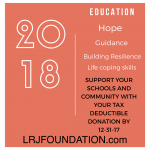 The LRJ Foundation educated 25,608 individuals on mental health and wellness and with your help, we can double that number in the 2018 school year! Become a donor or sponsor today. Changing the talk of Mental health in our schools since 2012.